Heme Oxygenase-1 Gene Promoter Polymorphism is Associated with Risk of Gastric Adenocarcinoma and Lymphovascular Tumor Invasion. Central CO-heme oxygenase pathway raises body temperature by a prostaglandin-independent way. 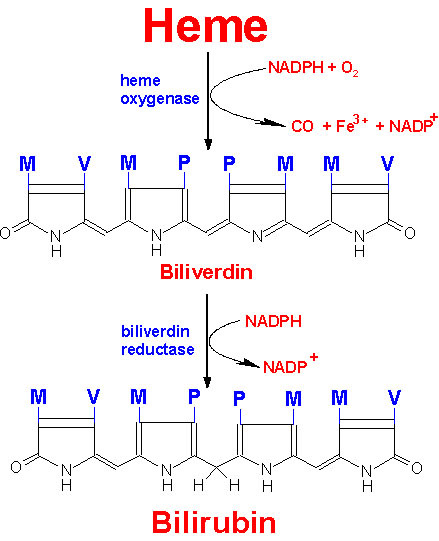 A possible mechanism that may be advanced to account for the positive relationship between fasting or hypoglycemia and the rise in serum bilirubin, is enhancement of bilirubin formation from increased heme turnover in the liver. In fact some studies about hepatic HO activity in rats show that HO activity increases progressively, reaching approximately 3 times the control value after 72 hours of fasting. A study valuates HO activity in relation with some hormones that are enhanced during hypoglycemia and starvation and reduced after meals: glucagon, insulin, epinephrine, arginine (which triggers the release of endogenous glucagon). The results of this study are below. Insulin-induced hypoglycemia was associated with an increase in hepatic HO activity that was similar to that seen in fasted animals (Table I). This stimulatory effect of insulin was blunted or abolished when the injected insulin was "covered" with glucose administered simultaneously (Table I), which indicates that insulin by itself does not stimulate the enzyme. link Metabolic Regulation of Heme Catabolism and Bilirubin Production I. HORMONAL CONTROL OF HEPATIC HEME OXYGENASE ACTIVITY. For experimental details, see text. $ nmole bilirubin formed per min per 10 mg protein A:SD.